Elizabeth Devine is a Registered and Licensed Dietitian Nutritionist, fitness specialist, and owner of Eat and Run, LLC. She holds undergraduate degrees in both Nutrition and Exercise Science from the University of Massachusetts Amherst and a Master’s degree in Health and Exercise Science from Wake Forest University. •a healthy diet and regular exercise are two of the biggest contributors to overall health. •adopting a healthy diet and engaging in regular exercise are two of the most important steps toward achieving and maintaining health. •there is a strong connection between proper nutrition and hydration and optimal athletic performance. peer-reviewed, scientific information in generating the most up-to-date guidelines and recommendations for her clients. In this way, she applies scientific information to real-world settings, taking the guesswork out of nutrition for health and sport for YOU! 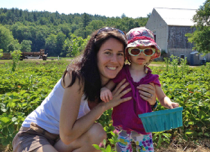 When she’s not working with clients or giving presentations, you can find Elizabeth outside running or biking, spending time with her husband, daughters, and energetic black lab, picking vegetables at her local CSA, creating in the kitchen, or reading the latest running novel.